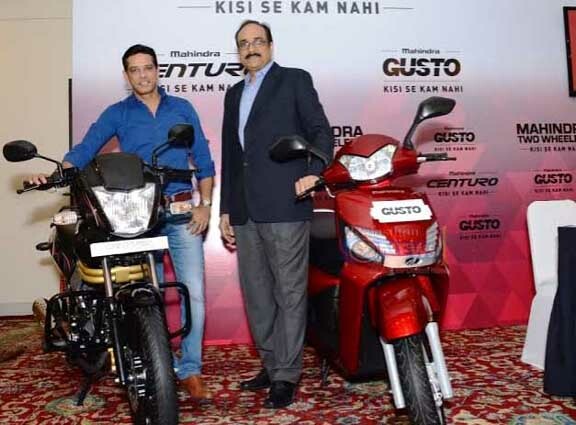 Jaipur : Mahindra Two Wheelers Ltd. (MTWL), a part of the USD 16.9 billion Mahindra Group, showcased a new communication campaign for its innovative range of two wheelers – the Mahindra Gusto scooter and the Mahindra Centuro motorcycle in Jaipur today. The occasion also marked Anup Soni, Television actor purchasing the Mahindra Centuro with unique features like Anti-theft engine immobiliser, Find me Lamps & Remote Flip Key. The TVC showcases the pride of Mahindra two-wheeler owners, as they now enjoy the same privileges that, until now, have been exclusive to car owners. Their confidence stems from the fact the Gusto and Centuro sport a host of category-defining innovations, which have only been seen before in cars. A unique and highly enjoyable film, it uses popular music to portray a series of light-hearted face-offs between car owners and Mahindra two-wheeler owners. The campaign has been highly visible and amplified across all mediums, including television, print, digital, radio, cinema and on-ground. Titled ‘Kisi Se Kam Nahin’, the film reinforces Mahindra Two Wheeler’s commitment to partner with its customers in their journey towards progress, in keeping with the company’s philosophy of ‘Rise’. Dharmendra Mishra, the vice president – Customer Care & Sales, Mahindra Two Wheelers said, “Kisi Se Kam Nahi’ reflects the confidence and pride that comes with owning our exciting range of two wheelers – the Mahindra Gusto scooter and the Mahindra Centuro motorcycle. Our differentiated products deliver strong performance and are packed with unique, car-like innovations, like the Height Adjustable Seat on the Gusto or the Remote Flip Key and Anti-Theft Alarm on Centuro." Speaking on the occasion, Anup Soni said, "It is an honour and privilege to be associated with Mahindra Two Wheelers, a company that is known for making tough vehicles that deliver strong performance. I also believe the Centuro motorcycle & the Gusto scooter are really innovative." "I am particularly thrilled about features like the Height Adjustable Seat on the Gusto and the Anti-Theft System on the Centuro that are extremely unique and useful. I simply love their products and I am certain, consumers would too – when they find out about the entire car like features that a Mahindra Two Wheeler has.” He further added. Car-like innovations on the Mahindra Gusto: Height Adjustable Seat, Remote Flip Key, Find-Me Lamps, Guide Lamp and Bright Halogen Head Lamp with LED pilot lamps.Car-like innovations on the Mahindra Centuro: Anti-Theft Alarm with Engine Immobilizer, an encrypted Remote Flip Key, Find Me Lamps, Guide Lamp and Digital Dashboard with a Service Reminder and Economy Mode indicator. Mahindra’s range of two wheelers is known for its distinctive styling, solid performance, great mileage and superior ride quality on tough Indian roads.